Animals have lots of ways of keeping cool. Dogs pant, humans sweat, koalas hug trees. But what about birds? Flying generates lots of heat, and getting rid of the excess is complicated when your body is covered in insulating feathers. Ecologist Donald Powers is interested in how hummingbirds regulate heat. The tiny birds can hover in the air and fly at speeds up to 39 feet per second (and some can hit about 88 feet per second while diving), beating their wings 80 times per second. The range of speeds, Powers figured, means they probably employ a few different ways of losing heat. To find out what those are, he and other researchers used an infrared camera to measure the heat lost by calliope hummingbirds flying in a wind tunnel. As they recently described in a study published in Royal Society Open Science, the team discovered that the birds have a few key heat dissipation areas (HDAs) that were consistently 46°F or more above air temperature during flight. These spots were around their eyes, under their wings, and on their feet—all areas where feathers are sparse or absent and heat can be shed easily. 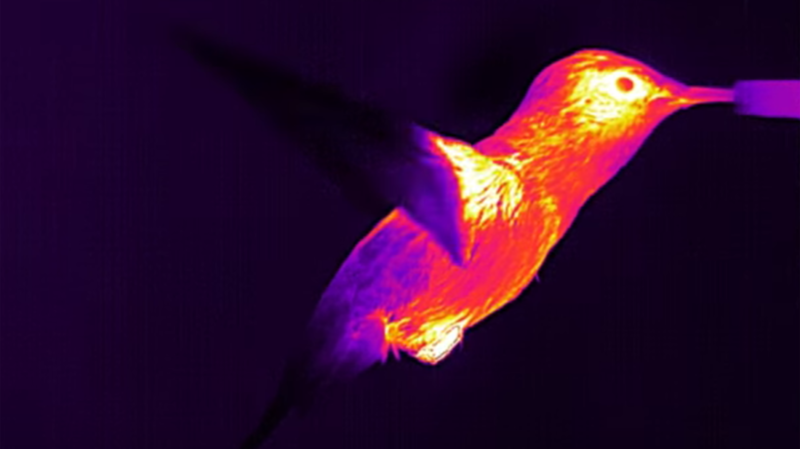 They appear as bright white spots on the hovering hummingbird in the infrared thermography video below. The different HDAs came into play at different flight speeds. The hot spots around the birds’ eyes, for example, were three times larger during hovering and slow flights than they were during faster flights. While hovering, the birds also dangled their legs instead tucking them in like they do during faster flights, maximizing their heat loss. The HDAs under the birds wings, meanwhile, were largest and highest in temperature at the lowest and highest flight speeds when the wing muscles were working hardest. All of this suggests that, as Powers predicted, hummingbirds use different heat loss mechanisms depending on how fast they're flying, with most heat lost through radiation at lower speeds, and convection becoming more important at higher speeds. It also suggests that hummingbirds have the hardest time maintaining a normal temperature while hovering, which requires more metabolic power and exposes the birds to less airflow. When it’s cold out, hummingbirds have to worry about regulating their temperatures the other way and keep themselves from losing too much heat. To stay warm in the winter, the birds slow their metabolisms down and go into torpor. Many species also head to warmer parts of the world, like the Rufous hummingbird, which usually lives in Canada and Alaska and spends winters in Mexico and the Caribbean.